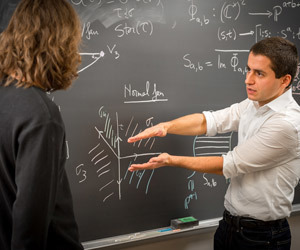 Claudiu Raicu, an assistant professor of mathematics, has received an Alfred P. Sloan Research Fellowship. The Alfred P. Sloan Foundation has awarded the two-year fellowship to 126 researchers across the nation, including just 20 recipients in mathematics. In recognition of his distinguished performance and unique potential to make a substantial contribution to his field, he will receive a $55,000 award. Raicu, who earned his undergraduate degree at the University of Bucharest in 2007, earned a Ph.D. at the University of California, Berkeley in 2011 and conducted postdoctoral research at Princeton University before coming to Notre Dame. His research is in algebraic geometry and commutative algebra, a growing field within the Department of Mathematics. Raicu’s research focuses on investigating the implications of symmetry to the structure of the solution sets of systems of polynomial equations. The Sloan award supports researchers’ ongoing education and collaboration, including trips to conferences, organizing workshops, supporting students, and hosting other scholars for research collaborations and seminar talks. Since the program started in 1955 recipients have included 43 Nobel Prize winners and 16 Fields Medalists. Chair of the Department of Mathematics Michael Gekhtman nominated Raicu for the honor. Originally published by Gene Stowe and Marissa Gebhard at science.nd.edu on March 17, 2016.